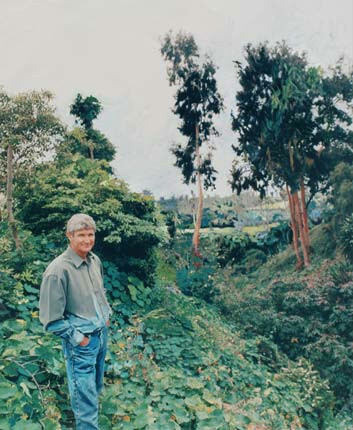 Robert Engel has pursued a career in art since the early 1970s. After completing his formal education in fine art at Cal State Fullerton, Robert worked professionally in painting, drawing and ceramics. In 1978, he became an art director for “Lighting Bolt” a highly successful sportswear manufacturer. Although he continues to do commercial art as a freelance illustrator, Robert regards “fine art,” especially watercolors, as his serious work. The artist has won numerous awards for his mixed media drawings and his work has been purchased for private collections all over the world including the Bank of A. Levy collection. His work is in the City of Ventura Municipal Collection and at the Carnegie Museum in Oxnard, CA. Nature provides the artist an inexhaustible source of inspiration and expression. When asked to comment on his bold and colorful work the artist replies “My drawings are a visual meditation on the mystery and wonder of existence.” Since 2002 he has taught art full-time at Hueneme High School in Oxnard. This portrait is a collaboration between Bob Engel and Donna Granata. After printing the photo, she asked Bob to paint on the image in such a way that the viewer would need to take a second look to see the texture of the image. His painting leads the viewer through the composition in a very deliberate way. Many of the photographs in the 2008 History Is Now exhibition at the Thousand Oaks Civic Arts Plaza needed to be reprinted due to instability of the inks and the limitations of the technology at the time the subjects were recorded. This is an example in point. Chemical reactions over time had diminished the original work. Bob graciously volunteered to paint on this new print. Robert Engel’s documentation took place in 2000. The FOTM Archive contains extensive information about this artist.